Content and Single – Lovely.Multifaceted.Chic. Ok, so maybe you’re thinking…”Here we go again. Another single black sista blogging her woes about being single with no man….” or maybe you could care less. Either way it goes, it’s my experience and I’m willing to share. This post is not about being lonely and needing a man…actually I am comfortably single and loving it. This post is also not about the shortage of good Black men…just keeping it 100 there’s a shortage of good people in general. Anyway, I do have the desire to be in a great relationship with a really good man. And at times, the desire is stronger than others. Sometimes when I see a lot of women around my age post pictures of their recent engagements and weddings on Facebook or when I see their relationship status change from ‘single’ to ‘in a relationship’, ‘engaged’, or ‘married’, I do share in their excitement. I am happy for them and I wonder when will I be able to change my relationship status or share the happiness I have found in a great relationship. I know there are other women who understand me. At times, I have questioned what am I doing wrong or what do I need to improve in. 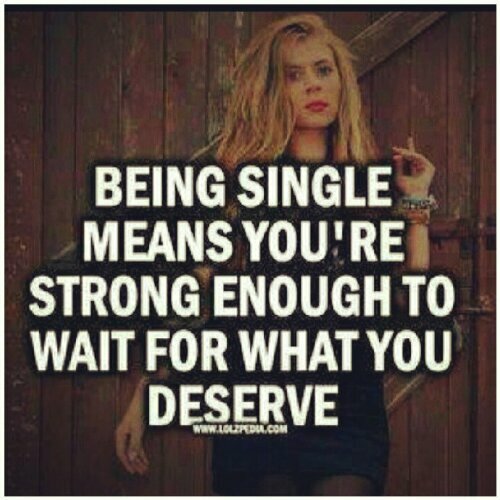 However, I am truly learning how to be content in my singleness. In my contentment, I have learned that lasting love takes time and settling is unacceptable. I saw this meme that reflects where I am. For all of hearts that desire love, patiently wait for the best. Hi I’m a new blogger. I would love it if you would stop by my blog and check out my blog and tell me what you think. And follow if you like my blog. Thanks again. Hi, I have checked out your blog…great work!